In this article, we will learn about the need for inheritance in ORM Tools and implementation of inheritance with ORM Tools. Inheritance, is the one of important feature of OOP that is used to passing its properties to child or sub classes. It is the way of establishing is-a relationship between class objects that inherit attributes and behavior of base class. It is the way of implementing polymorphism using method overriding. When we use inheritance with Object Relational Mapping Tools, it inherits the mapping attributes and behavior of base class to entity sub – classes . If we’ve the user class that has vehicle information to be saved. Without inheritance, it would necessary to save all the information about list of all kinds of vehicles. But by inheritance mapping, we will need to have vehicle id that will represent these different kind of vehicles. The another reason is to update any vehicle property in future is made easy using mapping inheritance. Let’s have an example to better understand the need of inheritance. We have a user class that manage information about user vehicles in itself. We can assign only one object of an entity class at a time and if we have multiple vehicle class type. This problem can be resolved using inheritance, where these vehicle type classes can be inherited by vehicle base class. First of all create an entity class ‘Vehicle’ that is the base class as listed in listing 1. The above code defines the Vehicle Entity Base class that defines two class variables ‘id’ and ‘name’ with its getter() and setter() methods. @Entity annotation is used to define this class as entity class that is defined in javax.persistence.Entity package. Two more annotations ‘@id’ and ‘GeneratedValue’ are defined in javax.persistence.GeneratedValue and javax.persistence.Id classes respectively. The above code defines a TwoWheeler java class that inherits properties of Vehicle class and defines a String type variable ‘SteeringWheel’ with its getter() and setter() methods. @Entity annotation defines this class as an entity class. The above code defines the FourWheeler.java java class that inherits the properties of Vehicle class and also defines a String type variable ‘SteeringHandle’ with its getter() and setter() methods. These entity classes are instanctiated in ‘CreateVehicle’ class that a database table to store schema for these three entities classes as listed in Listing 4. The above table defines a main() method. This method defines Configureation insatance that configures the “hibernate.cfg.xml” file and create SessionFactory class object to buildSessionFactory based on “hibernate.cfg.xml” configuration file. A Session class object is being created using SessionFactory class method openSession(). Once we have done with this, we create instances for Vehicle, TwoWheeler and FourWheeler classes respectively and initialize their data variables. A session transaction is being started using beginTransaction() method of Session class and save entity objects using save() mehtod of Session class. Now commit the beingTransaction using session.getTransaction.commit() method and close session using session.close() method. Once we have done this configuration, define the entity class type in hibernate.cfg.xml file as listed in Listing 5. The above figure shows list of jar files required to run this application. It list the MySql database connector and hibernate jar files bundle. 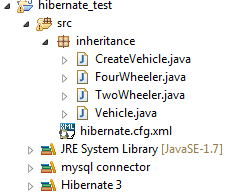 The figure shows the ‘inheritance’ package that contains all three entity class files and main class file ‘CreateVehicle.java’ that creates Vehicle database table to mysql database. 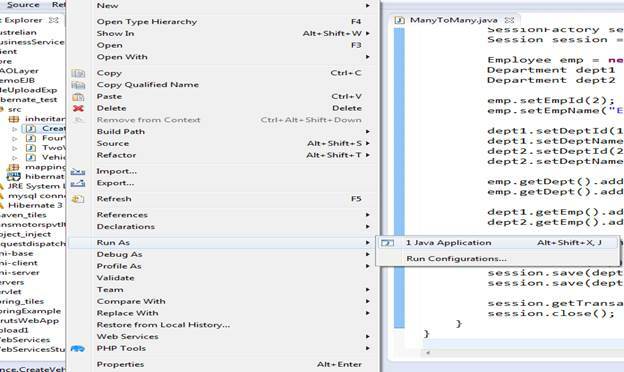 Right click on the class file and choose ‘Run As->Run as Java Application’ as shown in Figure 3. The execution of the ‘CreateVehicle.java’ class file creates Vechicle database table with its schema as shown in Figure 4. Figure 4 shows the database entry log into the console. It shows three entries made into the vehicle database table. The above figure shows vehicle database table created into the MySql database. As we have seen above, Hibernate creates a single table for these three entity classes. If there is an entry to vehicle table, ‘SteeringWheel’ colum and ‘SteeringHandle’ column rerord will remain empty and for ‘TwoWheel’ entity class, ‘SteeringHandle’ will remain empty and for ‘FourWheeler’ class, ‘SteeringWheel’ will remain empty. In this article, we learn about the inheritance and its requirement in hibernate object relational mapping tool. Inheritance gives us the way to assign and manage multiple entity types to a single object entry using its base class.